Going to the movies as a family with 3 kids has it's challenges and is a stressful adventure on its own, without adding Autism into the mix as well. Well for me I have no choice and I refuse to have any of my children miss out on any experience or be the only child in the play ground who hasn't seen a movie or been to the local circus solely because one of my children has a special gift. We've been to commercial cinema's before with all the kids, but since moving to Sydney, despite really wanting to go we really couldn't afford to, at $97.50 just for tickets, that's right just for tickets, that's before the popcorn and drinks, it was an expensive gamble to make with Master Z whom could quiet possibly get agitated with the crowds, level of noise, the feel of the seats, where he was seated, the smell of the the cinema, how bright or loud the movie was, the list is endless and there really is no telling what could set him off, only precautions to reduce the reaction he has to them and tactics to keep him calm, could be put in to place before hand. 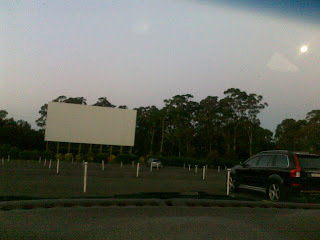 But when my hubby found an advertisement for the local black town drive in cinema's screening "The Lorax" and "The Pirates" and only for $25 a car we thought it would be a great way to start the Easter holidays. The kids decided on the pirates, so we packed some nibbles, drinks, chairs, jumpers, and areoguard (do not forget that) and set on our way. Now in comparing the two there are so many reasons why I prefer the drive in cinemas to commercial cinemas aside from cost, especially with a child with Autism, here they are in no particular order. Room to move without bothering anyone but yourselves (depending on where you park) Master Z along with my other 2 can't sit still especially for an hour plus, they continually climbed from the tray of ute into cab all night long. You can bring your own snacks, you can still purchase cinema food there as well, we grab fresh popcorn, but if your smalls prefer something else as a treat then that is an option. The level of volume is up to you as the movie audio is tuned in through your radio. They are in familiar surrounds, it is your car, there comfort zone, there safe haven, they can bring along favorite blankets etc, Master Z Brought his Pillow Pet. Depending on how many cars there are (we were lucky) they can run about the parking lot during the movie if the need is there and sometime it is needed. Less confined, I personally find Master Z doesn't feel confined or caged in, he loves the outdoors, yes he is scared of the dark and it was a full moon when we went, but the screen provided a lot of light, the snack shack behind us had lighting, the speaker hubs beside each car had lighting, and if he need further calming down we turned the door lights on in the car, but an after thought an a better option would be a battery operated push light. So next time the cinema's are in your sights for an outing, consider the outdoor type if your area has them. I've heard so many great things about drive in cinema's. Must investigate the local options. Highly recommended :D Don't forget aeroguard thou.